Hello, My name is Samantha Peden and I am your 2019 Rooftop Rodeo Queen. I am the 18 year old daughter of Kathy and John Peden of Loveland, Colorado. I am a senior at Loveland High School. I have been riding since I was 4 years old and currently I am riding on an IEA team as well as showing for AQHA. I am a member and officer in the Thompson FFA Chapter serving as the reporter for our chapter. I was also a member of my local 4-H club for over 10 years. My passion in life is spending time with my horses and friends that I have met along the way. My horse,Tilly, and I have been a team from the day I first got to ride her. I wasn’t too sure about it, but now looking back the bond we share is truly one of a kind. All the training I put into her was with the help of my coach Mark Guynn and Caylee Parish. I can’t thank them and my parents enough for giving me this wonderful opportunity of being your 2019 Rooftop Rodeo Queen. Estes Park has always been a place close to my heart because of the fond memories I created with my grandparents there. I am so blessed with the opportunity to be able to represent such an amazing town and rodeo. Hope to see you all at the 2019 Rooftop Rodeo! Howdy! This is Ruth Walker and I am your 2019 Rooftop Rodeo Attendant. I am a member of the third generation of Walker cowgirls and cowboys to own Sombrero Ranches since 1985. I find working at Sombrero Ranch a great opportunity to expand my range of equine knowledge. My horse is named Stage, which is short for Stagecoach. He insists on being the star of the show-just like me. I attend Estes Park High School and am actively involved in sports including basketball, volleyball, and track. I hope to continue to pursue basketball in Nebraska at York College where I can continue my interests and activities while becoming closer with the Lord. My favorite quote is Proverbs 2:6 "For The Lord gives wisdom; from his mouth come knowledge and understanding." I like this quote because all wisdom is from the Lord God and he gives it to whoever he will. Wisdom, knowledge and understanding are related aspects of the ability to judge right or to know the right moral or practical solution for unique dilemmas or situations. The world has so many blessings for you to enjoy. After graduating college, I will be learning the rest of the ropes to take over the family business and leading more people to the love and light of the Lord in the wonderful Wild West. Hope to see you at the 2019 Rooftop Rodeo! "Holly and I are working on setting Clinic and competition dates and will be able to get that to you, hopefully in the next week." The purpose of the clinic is to assist young Ladies interested in running for Rooftop Royalty or Rooftop Rodeo Princess positions with the information they will need to have a successful competition. *Enter the fair grounds through the East entrance off of Community Drive. Proceed west past the barns and park East of the Main Arena and Grandstands. Signs will lead you to the show office. (The green building west of the Maintenance Shop). This is the same building the Royalty Competitions were held in last year. Please RSVP to Megan at royalty@rooftoprodeo.com by Thursday, April 18th. Check in for each competition will begin at 8:00 am and the competition will begin promptly at 8:30 am. Applications will be due 2 weeks prior to competition and released shortly! For questions, please contact Megan at royalty@rooftoprodeo.com. 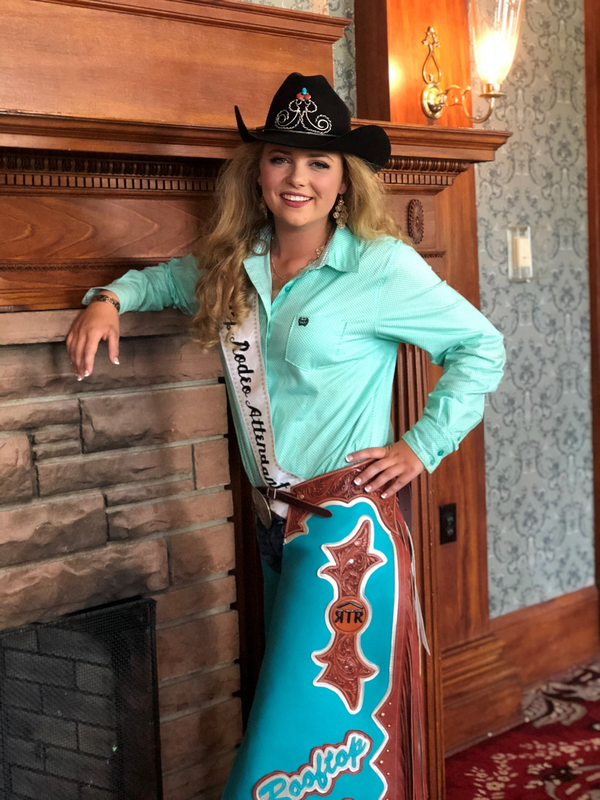 The Estes Park Western Heritage (EPWH) Rooftop Royalty program is taking applications for Queen, Attendant, Senior Princess, Princess and Wranglers for the 2019 Rooftop Royalty program. For this year, the residents’ requirement for applicants has been expanded to within a 60 mile radius, on the Front Range, from Estes Park. The royalty program is designed to provide an opportunity for area youth between the ages of 9 and 25 to learn about the sport of rodeo and promote the Rooftop Rodeo, the town of Estes Park and the sport of professional rodeo. Princess and Wranglers are not required to ride a horse. The Queen and Attendant participate in rodeos throughout Colorado and Wyoming, and are required to ride a horse. Applications are contained in the royalty handbook. Queen, age 17-25 on May 1st of the competition year. Attendant, age 16-19 on May 1st of the competition year. Princess, age 11-15 on May 1st of the competition year. Wrangler, age 11-15 on May 1st of the competition year. Jr. Princess, age 9-10 on May 1st of the competition year. Jr. Wrangler, age 9-10 on May 1st of the competition year.